Hello Clique Kits fans! Erica back with you for another Designer in the Spotlight! This month we have two amazing designers and if you missed Nicole’s Q&A please CLICK HERE! Today I want to introduce you to the face behind the We R Memory Keepers Love Notes collection Amanda Rose Zampelli! The Love Notes collections is this months feature collection and we love the bold black and white mixed with the soft romantic colors! We had a great time planning this kit and we just can not get enough of this beautiful collection. Amanda took some time out of her day to answer a few questions about her creative process, some of her favorites and her inspiration behind her two collections! Please say hello to Amanda Rose Zampelli! 1. Tell us a little bit about your creative process. My creative process is like New York City: it never sleeps. I’m not always creating, but I’m always thinking about creating — looking for inspiration for my next artistic endeavor, whether it be from nature, from home décor, from fashion, from a bakery store window…I’m always ready to be inspired, and that’s a big part of the process. Once inspired, I usually move quickly through projects like a mini book or a home décor piece, needing to bang them out while the fire’s still burning for it. For longer projects, like creating a paper collection, the process is more formal. The first part of designing papers is creating a moodboard – or style guide – to get an idea for what colors and elements the line will consist of. Once my art director approves the moodboard, I can begin to experiment with patterns and colors until I have four or five papers that are representative of my moodboard and pair well together. To those five, I add a few more, I keep working (some designs stick, most don’t) and eventually – after a lot of sweat and tears and M&Ms — 24 complementary papers are made. Finally, embellishments and extras mimicking the style of the paper designs are made to create a complete collection. Where and when are you most creative? I am most creative first thing in the morning after a good night’s sleep and a cup of coffee. This has been true for as long as I can remember – being the best, most productive version of myself before the sun rises, while the world is still sleeping. Where I’m most creative is at my designated work space, whether it be at my computer desk or my crafting table. However, I’ve come up with some great ideas while on morning jogs through my neighborhood’s nature trail. What are some of your must have supplies? My MacBook Pro and iMac computers are must haves because my job entails lots of digital design. Plus blogging, answering e-mails, pinning to Pinterest, Skyping with the boss, are all part of the job too. As a crafter who prints her own photos and digital designs, my Fiskars paper trimmer is a must. I also love my Xyron Sticker Maker machine, washi tape collection, and my watercolor brushes and paint palette. Other influences include Kelly Purkey, Tina Aszmus, and Ali Edwards. I love their designs, I love how they memory keep, and all three take great photos. Also, Kal Barteski’s and Lisa Congdon’s art forever. Three things people probably do not know about you. 1) I used to be a Special Education Classroom teacher until I underwent a major career change from education to graphic design two years ago. 2) I hope to one day publish a poetry book. 3) If I watch a scary movie, it’s usually through a peep hole in my fingers. Can you share what helps you break out of a creative slump? First thing I try to do is accept the slump. It happens to everybody and patience is key. I went through a three-week long creative block during the beginning stages of designing Love Notes. In the case of that particular creative slump, I cranked out work everyday (good or not) and eventually – after a lot of sweat and tears and M&Ms — the line came together. If at all possible, stepping away from the slump is a great way to break out of it. Break out of the environment you’re slumped in. Take a walk or a nap or wait until the next morning to continue what you’re working on is often helpful. you tell us what inspired you when creating these collections? Thank you so much for saying that! 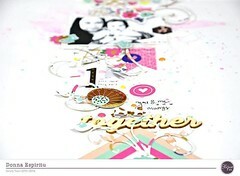 The inspiration for It Factor came from current trends and products I often use in my own pocket scrapbooking. When creating the moodboard for the collection, I infused a night life ‘party’ vibe with the painty, brush script look that’s trending right now. The colors for ‘It Factor’ were decided based on what I like use in my scrapbooking: black and white paired with bold color, always. Pink is a color that has a special place in my heart, so for my first line with We R, it was given. Yellow and teal are trending colors, as well, and helped give the collection the bold feel I was going for. The inspiration for Love Notes took some time coming to me, but ended up being a product of a mix of inspirations ranging from abstract watercolored paintings, thinking of a weekend getaway, and romance. The colors used for Love Notes are a mix of soft, complimentary, and romantic colors with bold and exciting black and white…kind of how love should be — a mix of soft and bold, romantic and exciting, yet always complimentary. Have you always had a love for design? Yes, yes, and yes, but it took me a long time to realize it wasn’t just ‘decorating for fun’ or ‘liking pretty things’ that I was into. There was a serious, passionate, artistically-fueled dedication of time to paper and making props for parties and communicating messages through words and font that I was putting in on a daily basis that made me realize, wait a minute, this should be my job. Sure! I turned 30 years old on November 9th, and I decided to make a birthday list of thirty things I’m goaling to do in my 30th year: my 30 IN 30. I’ve made a couple of these lists in the past, and felt inspired to try it again this year because I believe it’s necessary to write down good things to look forward to. Some things on the list are happy little reminders I can completely control: like #25: wear something sequins or #16: dress the cats in costume. Some things are new and exciting experiences that are going to be happening this year: #7: become an auntie (three times !!!) and #15: CHA! Winter Show! Some have definite beginning and end dates, and some are ongoing goals that need consistent practice. Modern, eclectic, and vibrant. I aspire for my style to be innovative as well. I like to follow trends, but I like pushing the barriers trends create more – possibly creating a whole bunch of new trends. Categories: Prom Committee, Spotlight Designer, Uncategorized | Tags: Amanda Rose Zampelli, cliquekits, Designer in the Spotlight, Love Notes, scrapbooking, We R Memory Keepers | Permalink. Such an AMAZING collection….have LOVED working with it in the kit. I now want the entire collection! Love the Q & A and finding out more about the designer!! This collection is my absolute FAV this year! I LOVE everything about it! I am on a mission to own every piece in this collection!! I love this collection. What a great Q and A! such a fun interview!! i love this collection – so beautiful! Thanks for such a fun interview! Love it! I love that you saw a job that you wanted and then made it happen. How awesome is that? What an awesome interview. It’s really cool to meet the person behind such a fun collection!